To access this church take the Illington road from the A11 junction with the B111. The Illington road leaves the slip road on the northern side of the junction. At Illington do not turn onto the lane leading to the village, use the farm track instead. This track is about thirty metres east of the lane. After about 200 metres there is a bridleway on the right which leads to the church. I have always parked on the grass at the start of the bridleway with no problems but can give no guarantee that it is ok to do this. The church is usually locked but the graveyard is accessible. Large areas of the churchyard are without gravestones though there are doubtless many graves there. 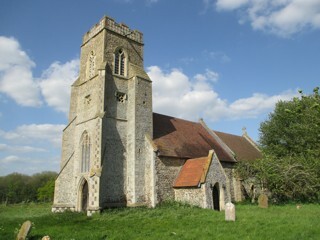 The church is in the care of the Norfolk Churches Trust. The GPR holds 33 grave and 61 person records for the burial ground.